These memory models are based on the IAR Embedded Workbench C++ compiler. It’s a fairly typical compiler for embedded systems development. For simplicity I’m ignoring padding issues; compilers will usually pad to the next word boundary, so assume what you see is word-aligned objects. 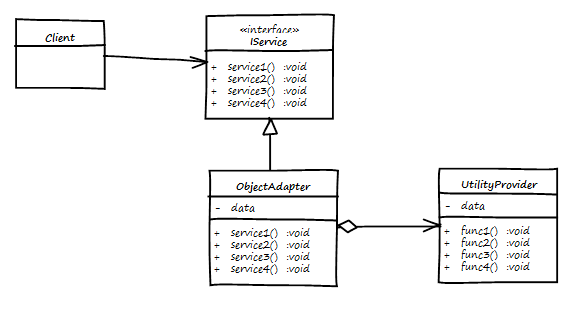 A quick reminder of the Object Adapter pattern. The ObjectAdapter class realises the IService interface and forwards on all calls to the encapsulated UtilityProvider object. 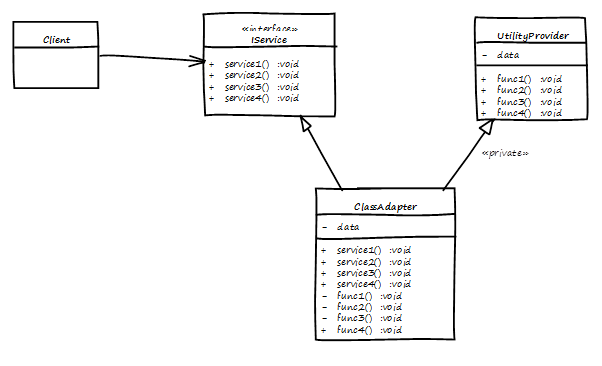 The Utility provider object can be created by the client and passed in the adapter, allocated on the free store by the adapter, or stored as a nested (composite) object. If the UtilityProvider object is a composite object the memory model changes (Figure 3). Note, the ObjectAdapter vtable pointer is still the first element in the object. Adding virtual functions to the UtilityProvider. Suppose our UtilityProvider class has virtual functions (for example Figure 6). How does this affect the memory model? virtual void func5(); // Requires a vtable. When the UtilityProvider class has virtual functions it gets its own vtable and vtable pointer (Figure 7). It’s worth noting the order in which the memory is allocated depends on the order of declaration in the class definition. In this example I’ve put the UtilityProvider object as the first declaration; before any other data. Note also that the ObjectAdapter’s vtable pointer is still the first element in the object. You should always favour having the Interface as the Primary Base Class. For more information on why see this white paper. This entry was posted in C/C++ Programming and tagged adapter, facade, memory, pattern, Virtual Functions, wrapper. Bookmark the permalink.